October 1959 cover. 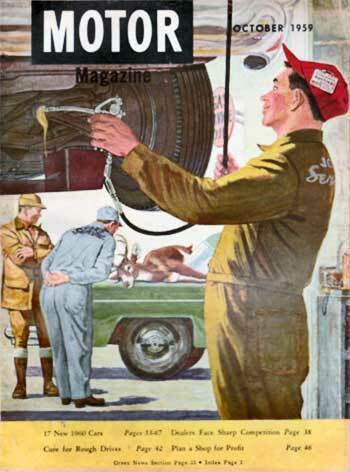 At Joe's service station, a mechanic lubes a car on the lift as one of his colleagues looks at a buck a hunter has just brought by in his green truck. Painter/illustrator James Blount Jordan, III (April 20, 1904 — September 26. 1979) was born in Nashville, Tennessee. He completed high school there and worked for a printer for a short while. He then trained with early modernist artist Charles Cagle at the Watkins Institute in Nashville. From there, he did a short course of study at the Chicago Art Institute and at a Boston arts school. Still desirous of additional arts education, he purchased correspondence course materials from the Famous Artists School, which was funded by the New York Society of Illustrators. His focus was on the illustration style of Robert Fawcett, legendary as "the illustrator's illustrator". As a young man, Jordan was found to be diabetic and, although insulin was in use as a treatment, he struggled to maintain his balance of blood sugar. His wife Lida Belle was instrumental in providing his health care. In the late seventies, he suffered back-to-back heart attacks. The first caused him to give up pipe smoking; the second took his life. A member of the Southern States Art League, he illustrated for MoToR from 1952 to 1960.